Here, you can make friends with the majestic polar bear, take in the vibrant culture of capital city Winnipeg, paddle alongside curious beluga whales, and discover the hospitality and friendliness of our people during a cultural festival that celebrates our roots. Polar bears are at the top of the must-see list: see them up close as they await the fall freezing of Hudson Bay near the northern town of Churchill each fall. Unique tundra vehicles, designed to move easily over snow and ice, provide protection while getting you in the perfect position to watch and photograph these majestic bears. 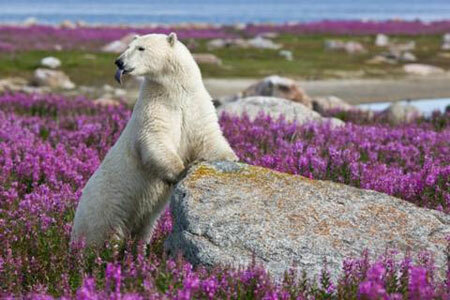 Or, you can walk amongst polar bears – an adventure fueled by adrenaline. As summer rolls around, Hudson Bay and the warmer waters of the Churchill River Estuary welcome another magnificent creature, the beluga whale. 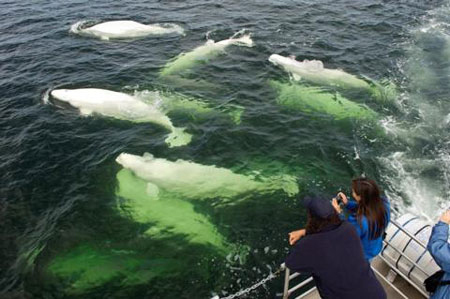 In July and August, as many as 3,000 beluga whales are found in the area. Boats equipped with hydraphones let you hear the whales’ clicks and chirps. 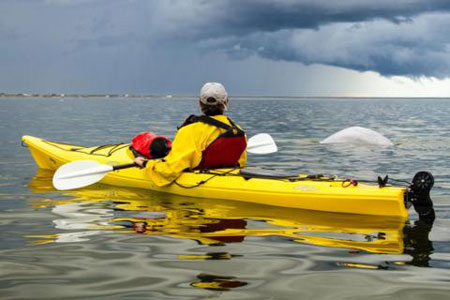 Curious by nature, they circle your kayak and swim alongside – a welcoming party you will never forget. 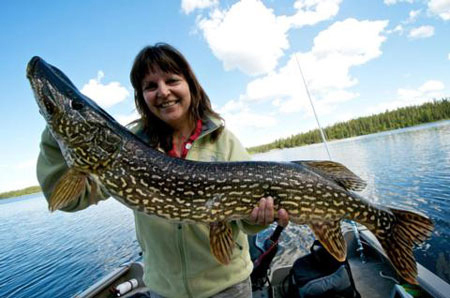 Manitoba is home to some of the best sport fishing in North America. From massive northern pike, huge walleye, furious lake trout to giant channel catfish – these trophy fish are photographed for bragging rights and then released back into the wild, sustaining populations and ecosystems. In Manitoba the opportunities for outdoor adventure are endless. Hikers, cyclists and skiers can choose from hundreds of kilometres of trails winding their way through Manitoba’s provincial and national parks. Make your way to the top of a magnificent waterfall at the northern Pisew Falls Provincial Park. Leave tracks in the sand at one of Manitoba’s natural oddities, the ancient dunes of the Spirit Sands in Spruce Woods Provincial Park to the west. Trek across the rugged beauty of the Precambrian Shield in Whiteshell Provincial Park to the east. 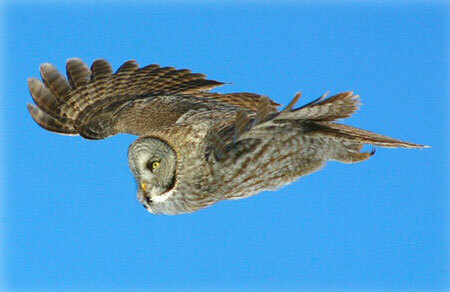 Located on two major migration routes, Manitoba, land of the Great Gray Owl, is home to 390 species of birds, almost three-quarters of all Canada’s species. The province’s diverse landscapes mean that birdwatchers can see whiskey jacks in the boreal forest region, meadowlarks in the prairies, herons on the lakeshores and sandpipers in the north. Manitoba’s largest lake is Lake Winnipeg. It boasts one of the world’s finest natural sand beaches, just an hour’s drive north of Winnipeg. 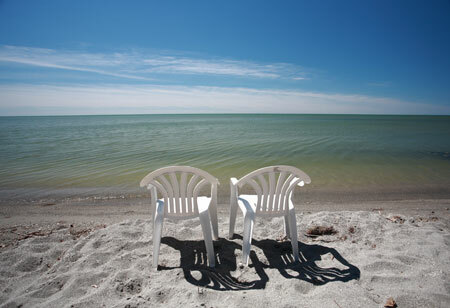 The aptly named Grand Beach features shallow water perfect for wading and soft white sand perfect for lounging. Watch as the sailboats drift by, or strap yourself onto a kite board and let the waves and the wind take you for a ride. For thousands of years, people have been gathering where the Red and Assiniboine Rivers meet: this is Winnipeg, Manitoba’s capital city. In heart of the city is the new Canadian Museum for Human Rights. Take a journey from darkness to light – a journey told through the stories of inspiring people and echoed by the awesome architecture of the building itself. Experience Manitoba’s lively festivals and fairs that celebrate the cultures, music, flavours and history of this diverse province. 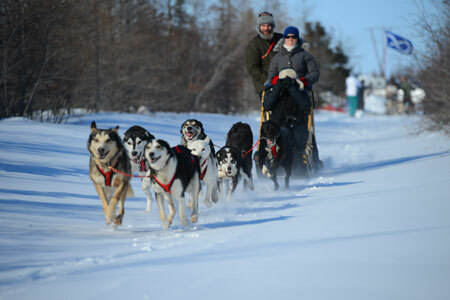 Head north to cheer dogsledders on a quest for glory or to marvel at the skills of modern day trappers. Discover the joie de vivre of the voyageurs and soak up the spirit of Manitoba’s proud multiculturalism. 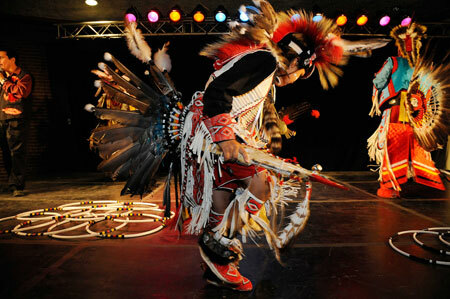 Feel the beat of an Aboriginal powwow or dance under the open skies at a top music festival. Enjoy Manitoba’s refreshing flavours and beautiful blooms. In every corner of the province you’ll find a festival or fair bursting with the energy of our people, eager to share their passions and proud heritage. Plan an authentic trip by staying in a Manitoba B & B. Whether your preference is city centre or at a historic home in a quiet prairie town, BBCanada.com offers many varied choices for your Manitoba adventure.